At coMakeIT, we are conscious of our humble origins and feel very fortunate and grateful for the opportunities that the society provided us. As a responsible corporate citizen, we believe in creating value through genuine and ethical entrepreneurial activity, and also in utilizing our wealth to create opportunities for all. Our philanthropic initiatives stem from a sense of deep-rooted belonging to the community around us, and we are driven by a sense of purpose to transform rural India towards self-sustenance by helping bring opportunities closer to talent. 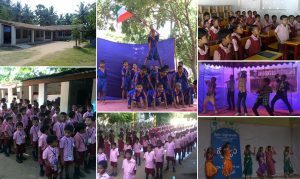 Support2Connect is a Netherlands based charity that supports school education initiatives in coastal Andhra Pradesh, India. The aim of this charity is to help the people of India make a sustainable living and gain prosperity. This charity routes all its activities in India through the Madhunapantula Foundation. The first initiative that was undertaken through the Madhunapantula Foundation is setting up a Foundation School to serve the village of Pallipalem in East Godavari district of Andhra Pradesh. Setup in 2006, the school started with 25 children, and currently teaches 160 children from Kindergarten to Grade 5.